Baked Potatoes are cut in half, hallowed out, and then the flesh is mixed with all of your favorite baked potato toppings and added back to the potato, then baked a little bit longer. The result is absolutely delicious! Have you ever been to a restaurant where they serve a baked potato the size of your head? You know what I’m talking about right, the kind of potato that takes up your entire plate? The kind of potato that looks like it was on steroids before they plucked it from the ground? The kind of potato that could feed an entire army of hungry soldiers? The kind of potato that could send you into a potato coma? You get my drift. There are some really huge potatoes served out there and if I happened to be served one of them, there’s only one way I’d want it prepared…. twice baked, baby! 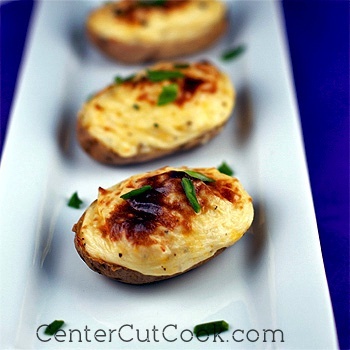 Twice baked potatoes seem to get cheated on in the kitchen these days because they look so complicated, or too time consuming, and no one wants to attempt to make them. I’m here to tell you that these ultimate twice baked potatoes are worth the time, and really, they are not so complicated to make. Yes, the baking time is a little high, but, what does that require of you? Absolutely nothing! You just have to plan in advance to make sure you have enough time to complete the entire baking process which is about one and a half hours. Perhaps you’re not willing to dedicate one and a half hours of your time to baking during the week, but these are perfect for a special weekend dinner, or a holiday. If you’re responsible for preparing Easter dinner this year, these twiced baked potatoes will definitely earn you raves from your guests. If twice baked really isn’t your thing, another great alternative are these Garlic and Herb Hasselback Potatoes. Notes: There are quite a few options with these potatoes. You could add bacon if you’d like, and you could swap out different cheeses (blue cheese crumbles, mozzarella, cheddar). When it comes to filling these potatoes, I like to mound the filling up, because then it looks pretty, which means I end-up discarding four shells. For example, I baked four potatoes, cut each in half and ended up with eight halves that I scooped the flesh from. When I filled them, I only filled four of the potato shells and discarded the remaining four shells that I had scooped the flesh from. Make sense? It all depends on how full you fill each shell. Pre-heat your oven to 400 degrees and prepare potatoes for baking by scrubbing them, and poking them with a fork a few times. Place potatoes on a baking sheet and bake in the oven for about one hour, or until tender. Remove the potatoes from the oven, and allow them to cool for a few minutes. Reduce the heat of the oven down to 325 degrees. Cut each potato in half lengthwise so that you are left with 8 halves. Carefully scoop out the flesh of each potato, leaving about 1/4 inch of flesh. Using your mixer, combine the potato flesh with sour cream, butter, cheddar cheese, bacon (if you’d like), sea salt, and black pepper. Mix until light and fluffy. Scoop the mixture back into each potato shell. If you fill each shell pretty full, you will end-up discarding four halves. If you’d like a crispy top, turn your broiler on to high and allow the potatoes to broil for about 3-4 minutes. Watch the potatoes very carefully as they will burn quickly!